It can often be daunting when choosing a lighting system due to the amount of options available. In order to simplify things, we have put together a number of kits to match most growers’ needs. In this section, you will find a range of systems suitable for varying types of plants and all stages of a plant’s life. For propagation and smaller plants (such as herbs or lettuces) a Compact Fluorescent Lighting (CFL) kit is usually adequate. 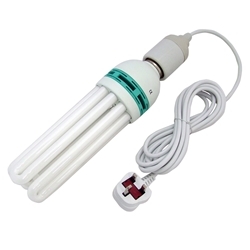 Examples of these include the CFL Pro Kit; Fluorescent Tube Lights; or T5 Propagation Lights. 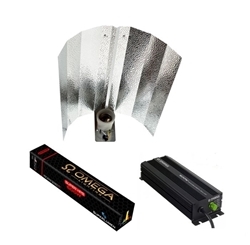 For larger or fruit-bearing plants, we would recommend using a system which includes a High Pressure Sodium (HPS) lamp. 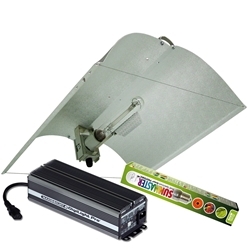 These kits come with a ballast, a reflector and a dual-spectrum bulb. Likewise, there are a number of reflectors which are available, each varying in their abilities and cost. 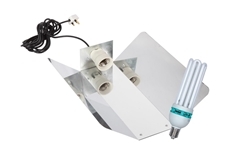 The standard Euro reflector is an excellent choice for growers on a budget, providing a cheap and effective way of reflecting light from your lamp. The Adjust-a-wing range of reflectors offer a larger spread of light, as well as a highly reflective surface. 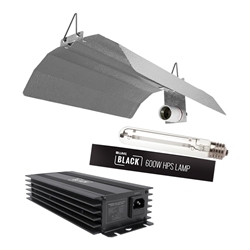 As HPS lamps will generate a lot of heat, you may wish to choose a lower wattage system if you are growing in a confined area. 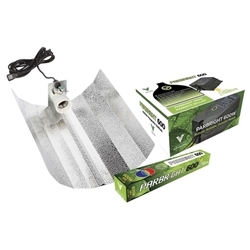 This will enable you to keep temperatures at an optimum level for your plants. Alternatively, you could choose a system with an air-cooled reflector. 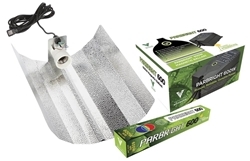 These reflectors keep fresh air flowing over the surface of the bulb, extracting most of the heat from the source and helping to keep temperatures low in your grow room. These reflectors do require an extraction kit, however, which is sold separately. Regardless of how much you are willing to invest, you can expect great results from any of the systems on this page. If you have any queries regarding these systems then do not hesitate to contact us via email, over the phone or at our central South West London store.